Throw the apple, cherries, dried fruit, zest, stevia, spices and coconut water into a large deep pan and heat on the stove for 35 minutes, covered with a lid, stirring occasionally. While the fruit cooks, preheat the oven to 180 C.
Pulse oats, coconut, CLP, cinnamon and salt in a processor, then pour into a medium bowl. Stir in the flaked almonds, coconut oil and maple syrup until mixture is crumb-like. Once the fruit mince is ready, pour it into a medium baking dish. Top the mince with crumble mixture, patting down firmly with a spatula to form a thick layer. 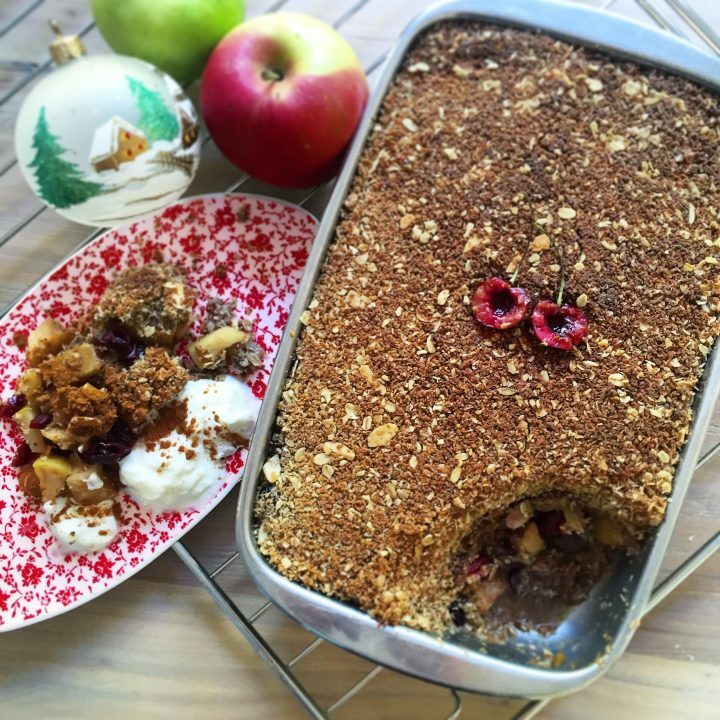 Press any decorative fruit into the crumble - cherries, apple slices or figs. Cook for 35 minutes, until golden. Remove from oven, and allow to stand for 15 minutes before serving with coconut yoghurt, cashew cream or ice cream!